1962 Establishment of the Kashiwa City Development Association Incorporated Foundation. 1969 Renamed as the Kashiwa City Urban Development Public Corporation Incorporated Foundation. 1993 Organization is changed to the Public Corporation for Urban Development in Kashiwa City. 2013 Changed to the Kashiwa Community-Building Public Corporation General Incorporated Foundation. How to apply for Bicycle Parking Lot. The whole application process can be completed from start to finish at the Kashiwanoha Campus Station Bicycle Service Center. To apply, please bring your identification card at Cycle Service Center. Please pay the fee for the Bicycle Parking Lot. Put a sticker on a bicycle and get a permit card for the usage period. The 1st Bicycle Parking Lot (located in the Kashiwanoha Campus Station) for long-term permits and one-day usage. At the 1st Bicycle Parking Lot (located in the Kashiwanoha Campus Station) for long-term permits and one-day usage. The 2nd Bicycle Parking Lot (located in the Kashiwanoha Campus Station) for long-term permits only. The 3rd Bicycle Parking Lot (located in the Kashiwanoha Campus Station) for long-term permits only. 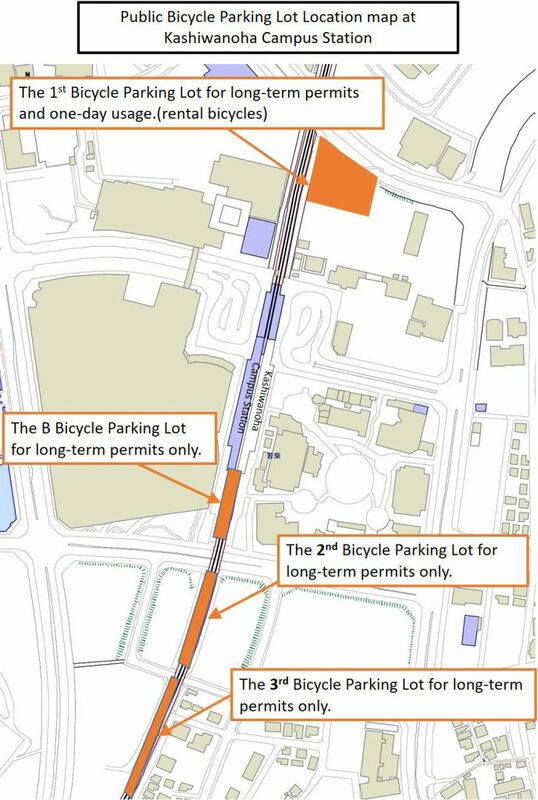 The B Bicycle Parking Lot (located in the Kashiwanoha Campus Station) for long-term permits only. If you pay the fee at the beginning of the contract (in April), you can pay using a post card at a convenience store. To renew your permit card, you can at the management office, and they will issue a new sticker. You do not need an ‘Inkan’(name stamp) for the application. Permits are granted for a specific time period even if you do not use the parking lot during this time, you must re-apply at the end of the time period. ※There is no student discount available for scooters. ※You do not need to apply ahead at time for one-day usage. （At the 1st Bicycle Parking Lot (located in the Kashiwanoha Campus Station) for long-term permits and one-day usage）. Operating Hours　6:00 a.m.～8:00 p.m.
※Under 50cc Scooters Parking Lot is The 3rd Bicycle Parking Lot. ※Over 50cc Scooters are prohibited in this Parking Lot.